This week Sunshine State Counseling Center is focusing on the communication used between parent and child. 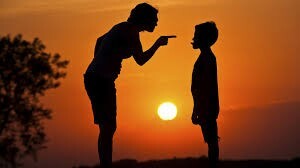 It is not uncommon for parents to get frustrated with their child, and therefore, can lead to words being spoken without thinking first. The following phrases or situations are some examples as to what we should avoid saying to children and why this can be significant to a child’s mental health. A child should never be caught in the middle of parents’ arguments, disagreements, or witness hearing negative talk about the other parent. This can not only set a bad example for your child, but it can also cause your child to feel they have to choose sides or feel pressured to also speak negatively of the other parent. It is best to speak kindly about your partner in front of the child to avoid these feelings of pressure and differences. No parent is perfect, and therefore, finding the right words in the moment can sometimes be a challenge. All parents get frustrated with their child from time to time and some of the above statements may be said. If that is the case, remember to apologize immediately and let your child know that you did not mean what you said and that you love them. Children need parents that encourage them rather than being spoken to with hurftful words that ultimately could affect their mental health and self-esteem.